Yes you need the green button. They are not easy to come by anymore. Good luck. I know the parts place makes the yellow one new . is this about the same size? I think that one is smaller than original. Hey Kevin, is the yellow one that is made new, the same size and shape of the original green one? I want to put a power trunk release in my car, but I don't need a numbers matching, correct color green button. On a side note, I do like original cars. 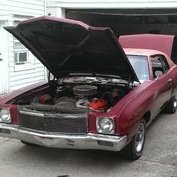 My 1968 Camaro RS/SS 350 3 speed floor shift car was original from 1968 to 2015. Except for mag wheels, it was correct. I sold it to a guy that said he was going to restore it. Sent me a picture of it recently..... The ONLY thing that is original now, is it's a 1968 Camaro RS/SS. EVERYTHING else is different! Yes the yellow button is the same size just yellow. I am kind of a freak for keeping a car original. Mine is an unrestored car and I have kept it pretty much all stock. The only thing that does not look factory original it the turn down chrome exhaust tips that were on it when I bought it almost 20 years ago. That said.... If I wanted to install an electric trunk release I would install it and not worry much if the button was yellow, green, black, red or whatever other color you could think of since it is mounted inside the glove box. That said, if you ever decide to sell it and leave us behind we will ding you on your ad that shows the wrong color trunk release button hidden inside the glove box..... No we wouldn't... maybe but then again maybe we would.